Step aboard for a day, a sunset or an overnight cruise. Discover stunning spots in the neighbouring islands. Day sailing tour to the neighbouring islands of Rhenia & Delos or to the south coast of Mykonos. Departure at 10.00 am (from the 15th of August at 9.30 am). Two swimming/snorkeling stops (snorkeling gear provided). Full lunch served aboard: Mediterranean style, freshly cooked on-board, right in front of you! Open-bar (sodas, water, beer, white wine). Sunset sailing tour to the neighbouring islands of Rhenia & Delos or to the south coast of Mykonos. Departure at 3.30 pm (from the 15th of August at 3:00pm), return just after sunset. Two swimming/snorkeling stops (snorkeling gear provided). 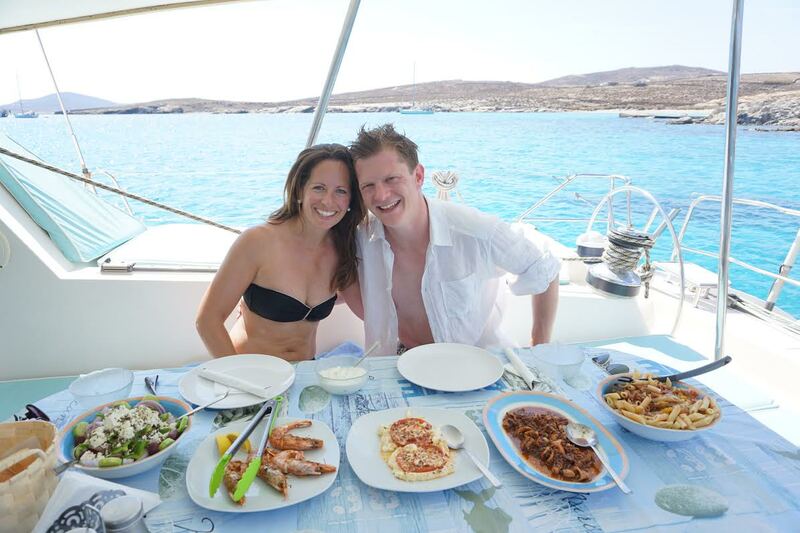 Full dinner served aboard: Mediterranean style, freshly cooked on-board, right in front of you! Open-bar (sodas, water, beer, white wine). We are passionate sailors and we always prefer hoisting the sails rather than motoring. This is why we own models of catamarans well-known for their sailing efficiency and seaworthiness. Experience the thrill of sailing with us! 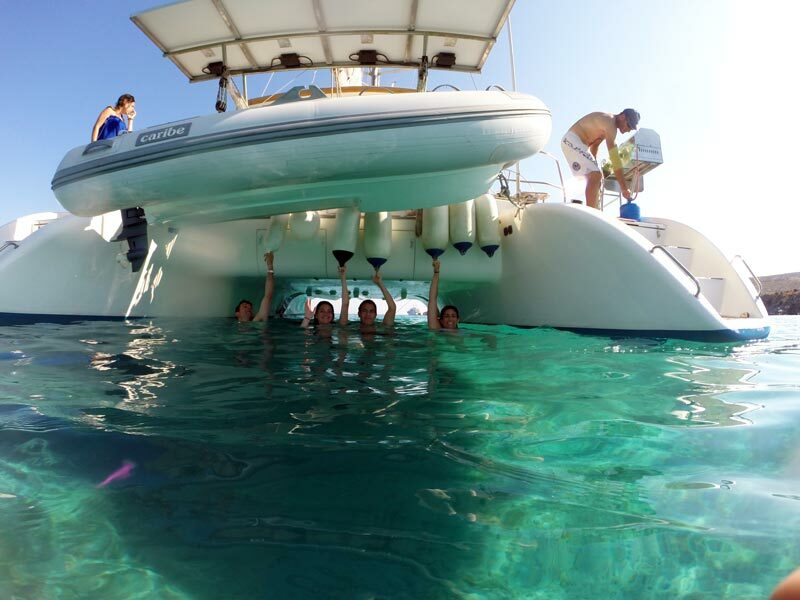 Our catamarans and our RIB speedboat are extremely stable and safe and handled by highly experienced captains. We intentionally limit the number of guests on board in order to ensure an outstanding level of service. Delicious gourmet full meals cooked “live”! FULL DAY sailing cruise to the neighbouring islands of Rhenia & Delos and/or to the south coast of Mykonos (ancient site of Delos upon request, weather permitting). Departure at your convenience. Two or more swimming / snorkeling stops (snorkeling gear provided). Full lunch served aboard and Open-bar. Sailing tour to the neighbouring Cyclades such as Paros, Naxos, Koufonisia, Santorini, according to your wishes. Scheduled upon request. Up to eight guests, in four double cabins with en suite bathrooms. Available until end of May and from the 15th of September. Advance booking only. Half or Full day tours aboard our RIB speedboat to the neighbouring islands of Rhenia & Delos and/or to the south coast of Mykonos. 8 hour Full Day tour: starting time at your convenience. Swimming / snorkeling stops wherever you wish on the way. Light snack and drinks included. Upon request: Transfers around Mykonos or to further destinations like Paros, Naxos and Santorini (weather permitting).